cose to a lesser extent (10%). Glycogen is a branched polymer of glucose, which contains as many as 100 000 glucose units. 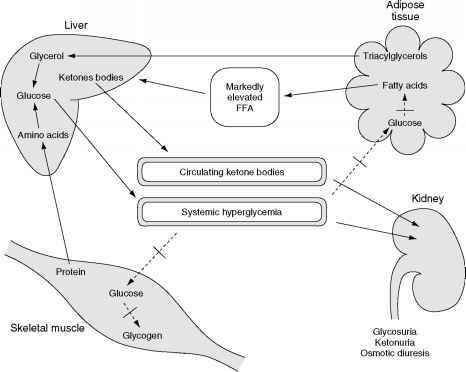 The breakdown of glycogen for the production of glucose is known as glycogenolysis. Glycogen breakdown is initiated at the nonreducing ends of its branches. It consists of phosphorolysis of single glucose units by the cooperating enzymatic action of glycogen phos-phorylase and the debranching enzyme. The product of phosphorolysis, glucose 1-phosphate, needs the additional action of phosphoglucomutase to convert it to glucose 6-phosphate. The liver contains the enzyme glucose 6-phosphatase for the hydrolysis of glucose 6-phosphate to free glucose, which can then be exported to the target tissues. However, the muscle and brain do not contain this enzyme, and the glucose 6-phosphate they produce enters the glycolytic pathway for energy production. Glycogen is a very efficient storage from of glucose, having an overall efficiency of storage of approximately 97%.